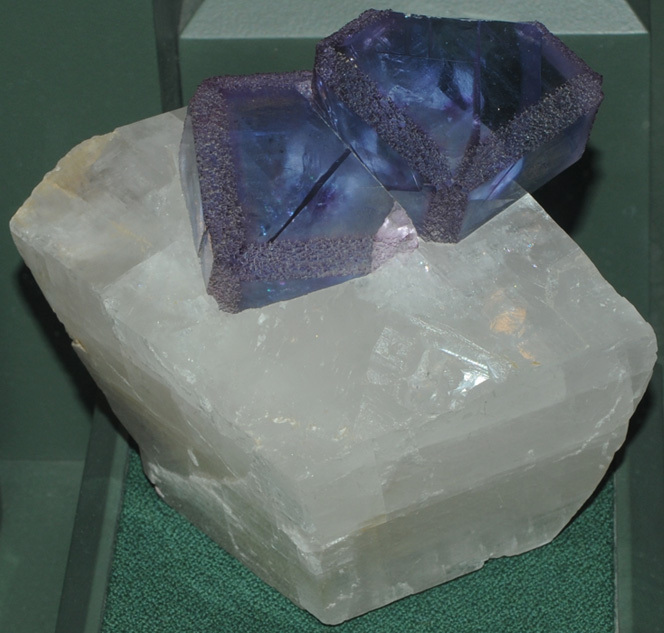 These examples of fluorite are on display at the Smithsonian Museum of Natural History. 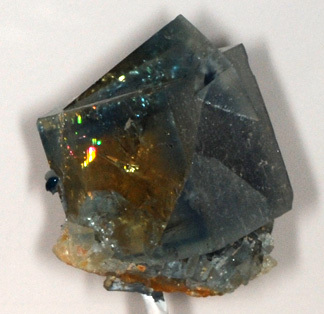 Fluorite is CaF2. 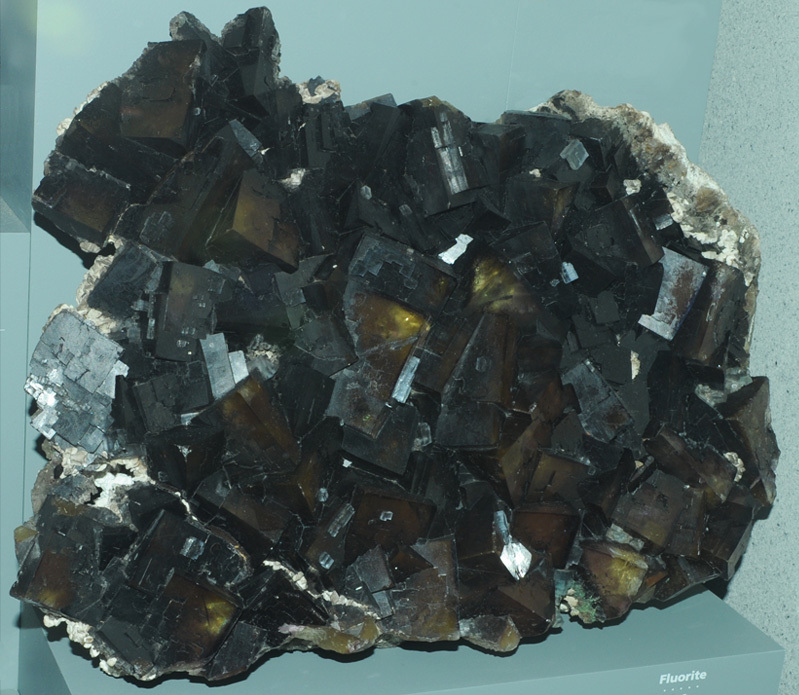 The sample above is from Dalnegorsk, Primorskiy Kray, Russia. It is about 20 cm wide. It was found in a lead and zinc mine. Fluorite is used to manufacture steel and is the main source of fluorine for toothpaste, fluoridated water, coolants, and Teflon. This fluorite sample is from Cave in Rock, Illinois. It is about 10 cm across. 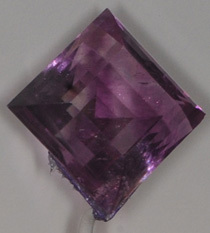 Deep purple color in fluorite has been connected with the effects of radiation knocking out a few fluorine atoms from their lattice locations, the vacancies producing color centers. 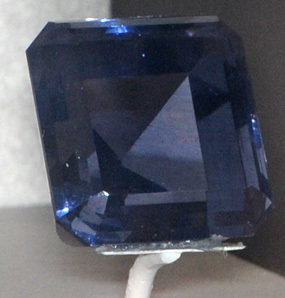 This 111.2 carat fluorite gem is from Hardin County, Illinois. 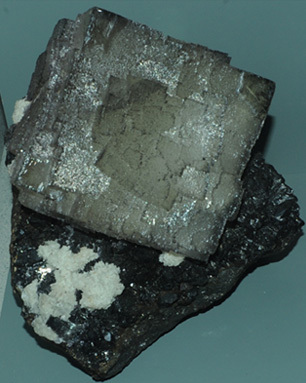 This sample is described as fluorite with galena. It is about 20 cm wide and is from Cumbria, England. It has a deeper purple color than the sample above and may be a more extreme effect of fluorine vacancies absorbing all colors except the purple. 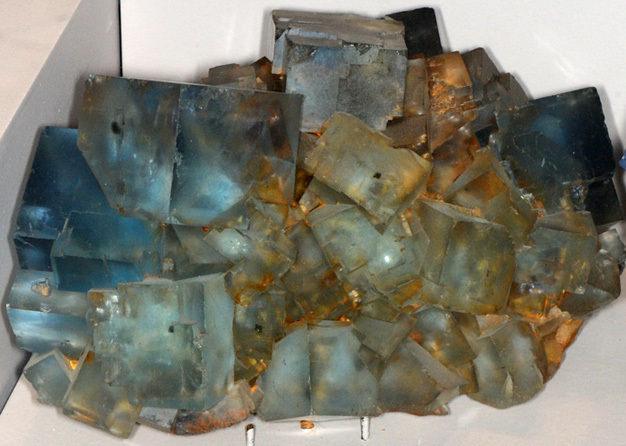 This fluorite sample is about 40 cm wide and is from Cumbria, England. 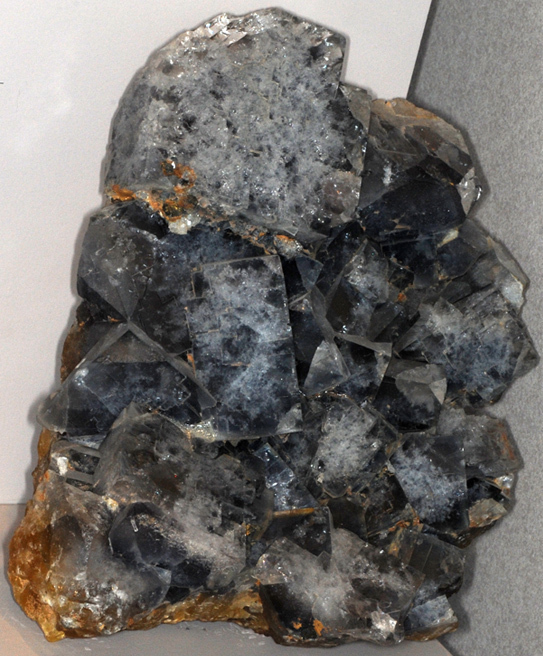 Fluorite crystals on a base of calcite at right. 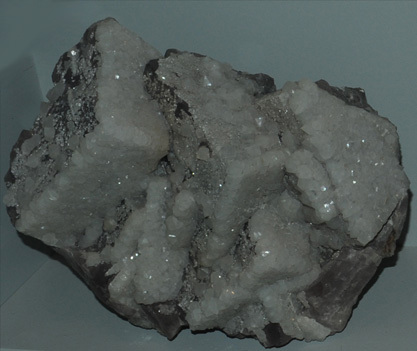 This sample is about 15 cm cross and is from La Collada, Asturias, Spain. 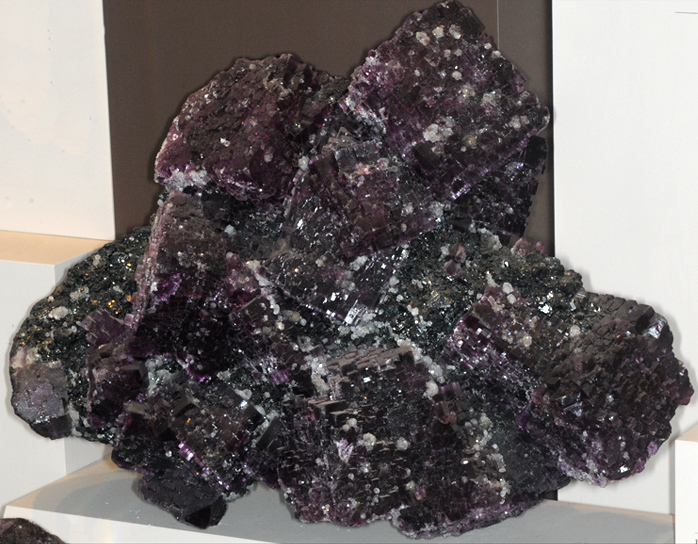 This large fluorite sample is from Ozark-Mahoning mine, Rosiclare, Illinois. It is about 30 cm across. 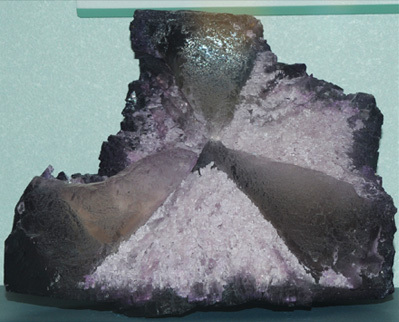 The large fluorite sample bove is about 50 cm across and is from Hardin County, Illinois. 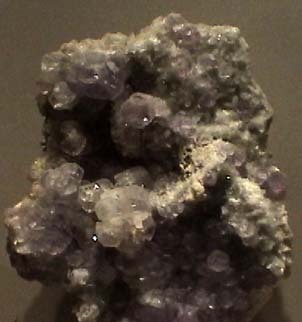 This region of southern Illinois was a major producer of fluorite from 1835 to 1995, providing a fluorite resource for steel-making. 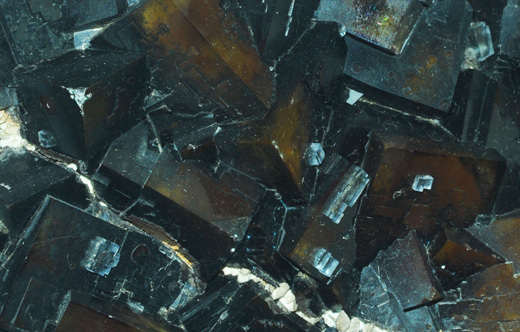 At right is a section of that sample to show more detail about the crystal formation. 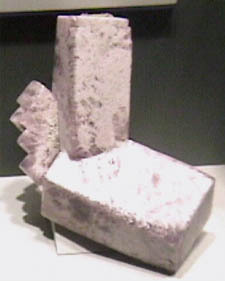 This large fluorite specimen is from Spar Mountain mine, Cave in Rock, Illinois. It is probably 60 cm across. 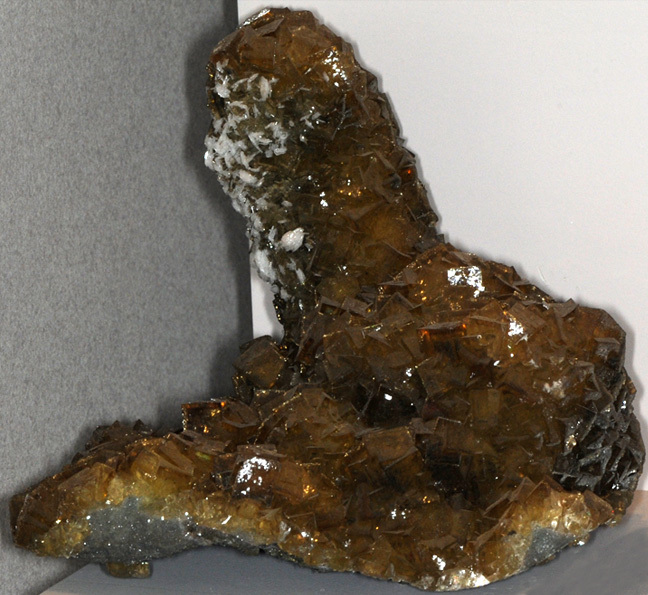 This fluorite specimen is from Elmwood mine, Carthage, Tennessee. It is about 20 cm wide. This is fluorite with barite from Elmwood mine, Carthage, Tennessee. It is about 25 cm wide. There was an interesting story about these two samples, which look very similar. The sample above is fluorite with a quartz overlay, while the one at right is completely quartz with a shape like fluorite. This was used as an example of overgrowth and replacement of one kind of mineral by another with time. 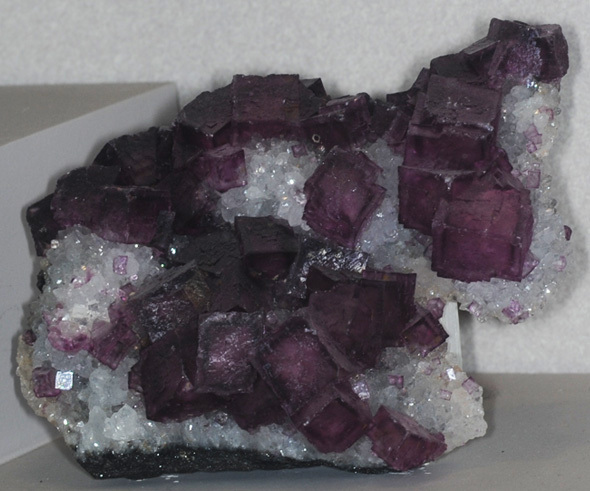 The left sample is composed of purple fluorite crystals which are partly frosted by quartz. In the sample on the right , the quartz completely overgrew the fluorite, which then dissolved. Only a quartz mold remains. Both samples are from Cumbria, England with the right one more specifically located in Weardale. 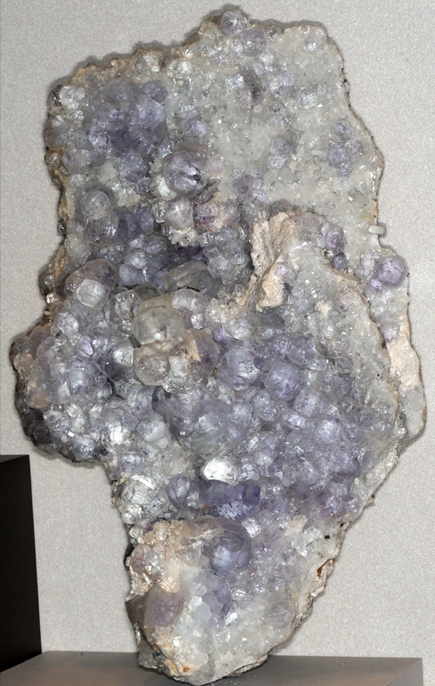 This fluorite sample is from Minerva mine, Cave in Rock, Illinois. It is about 20 cm across. This is fluorite with sphalerite and barite from Elmwood mine, Carthage, Tennessee. It is about 15 cm wide. 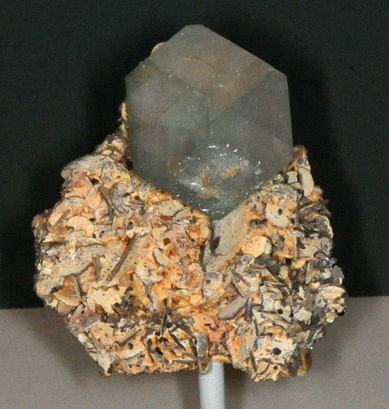 This is fluorite with barite and galena from Elmwood mine, Carthage, Tennessee. It is about 25 cm wide. 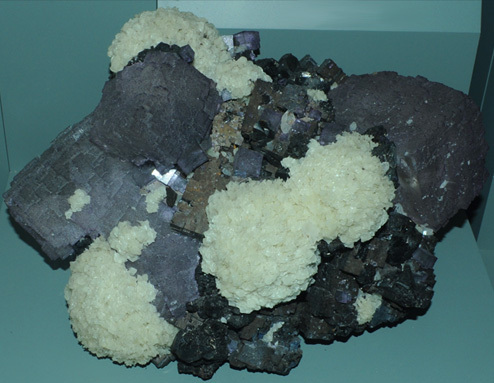 This is fluorite with galena and barite from Elmwood mine, Carthage, Tennessee. It is about 8 cm wide. 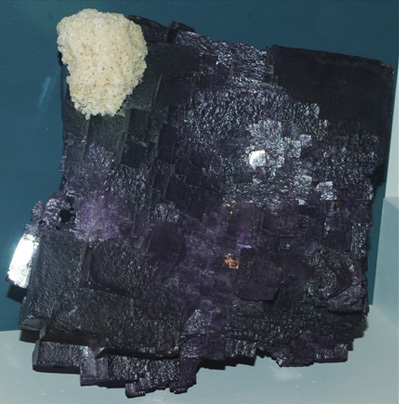 This is fluorite with galena from Elmwood mine, Carthage, Tennessee. It is about 10 cm wide. The sample at right is fluorite with sphalerite and barite from Elmwood mine, Carthage, Tennessee. It is about 12x35 cm. 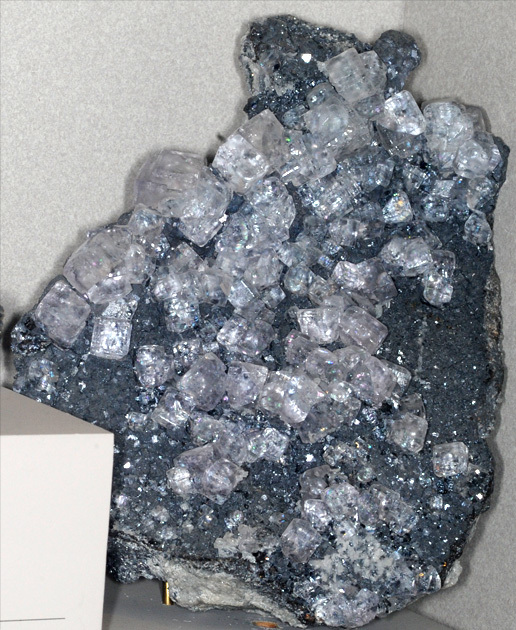 The sample above and the closer view at right are described as fluorite with barite. 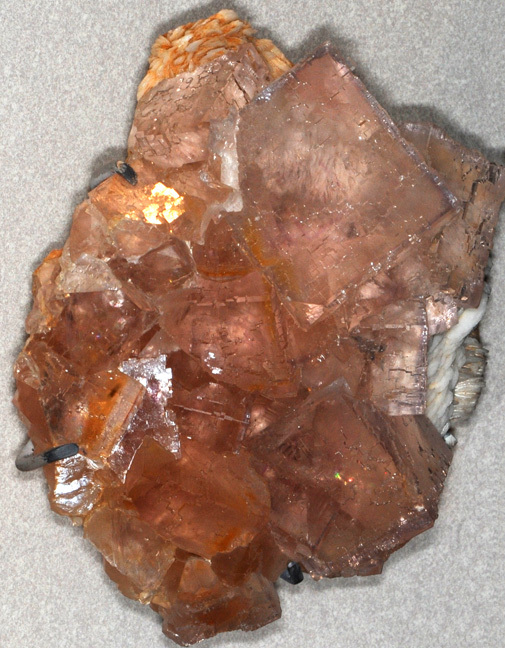 The sample is about 10x6 cm and is from Cave in Rock, Illinois. The sample at right is fluorite with pyrite. The sample is about 6x6 cm and is from Huanzala, Peru. This fluorite crystal about 3x3 cm and is from Beililfe mine, Freiberg, Sachsen, Germany. 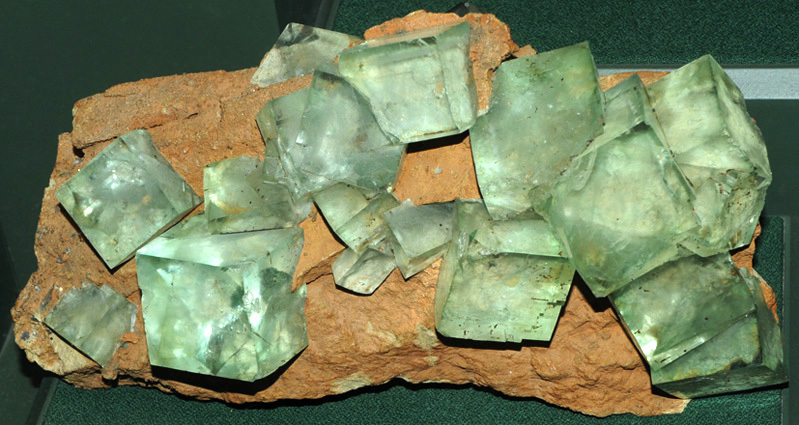 The fluorite crystal at left is about 3 cm across and is from Cumbria, England. 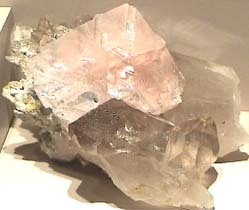 It is described as fluorite with calcite and quartz. The sample below is 12-15cm across and is from the Ohara, Oita, Japan. The sample of fluorite at left is about 13x13 cm and is from Naica, Chihuahua, Mexico. 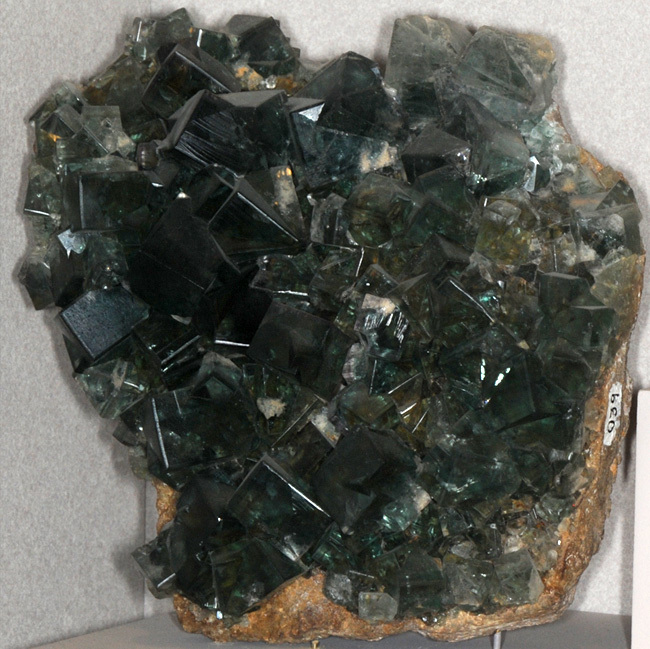 It is described as fluorite with galena. This is fluorite formed with quartz from Leiyang, Hunan, China. This is the top portion of a sample which measured about 12x20 cm. 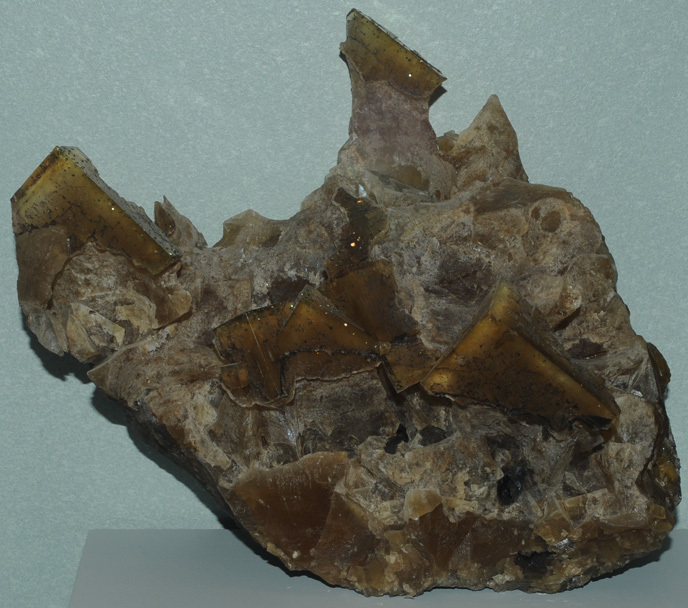 This sample is described as fluorite with sphalerite. 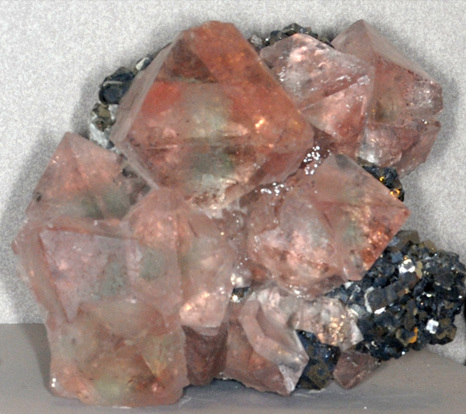 It is about 18x16 cm and is from Ozark-Mahoning mine, Rosiclare, Illinois. 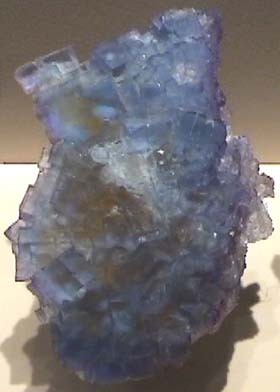 Fluorite crystal formation about 10x6 cm from Puy de Dome, France. 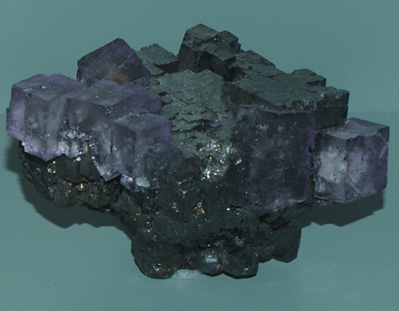 At left, an 8x12 cm collection of fluorite crystals from Beililfe mine, Freiberg, Sachsen, Germany. 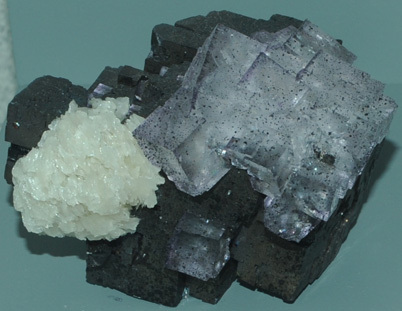 An 8x8 cm sample of fluorite with quartz from Galenstock, Uri, Switzerland. 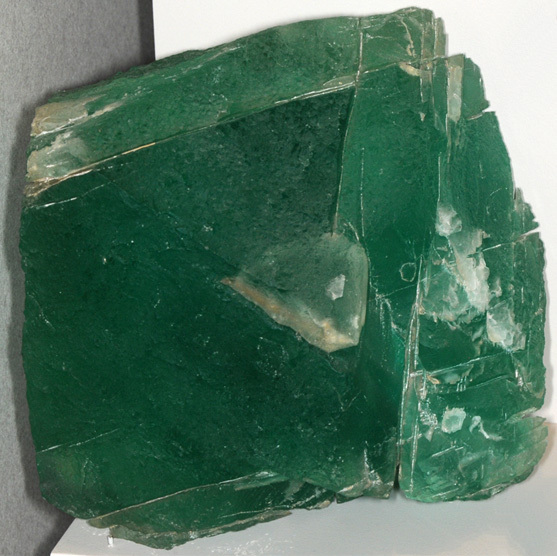 This fluorite sample is about 14x14 cm and is from Cumbria, England. 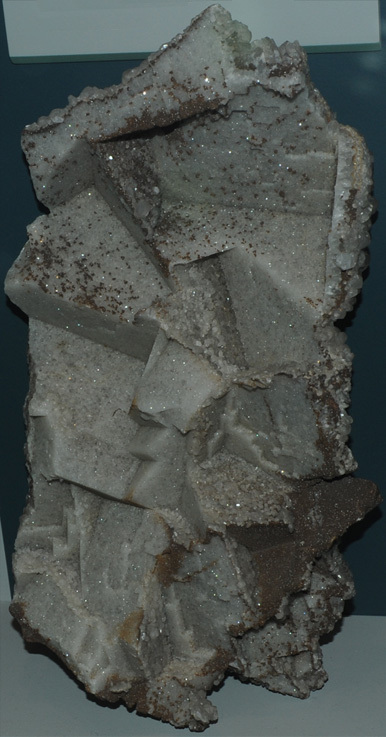 This sample is described as fluorite with barite. 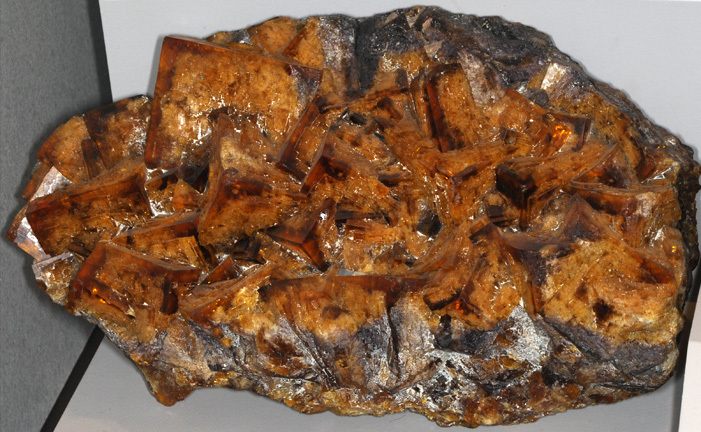 It is about 15 cm wide and is from Moscona mine, Solis, Villabone area, Asturias, Spain. 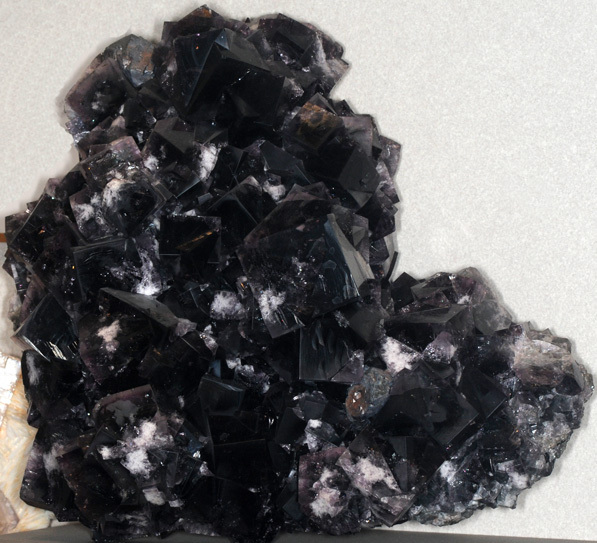 This fluorite sample is about 14x15 cm and is from Westmoreland, New Hampshire. These gems are from the same location. 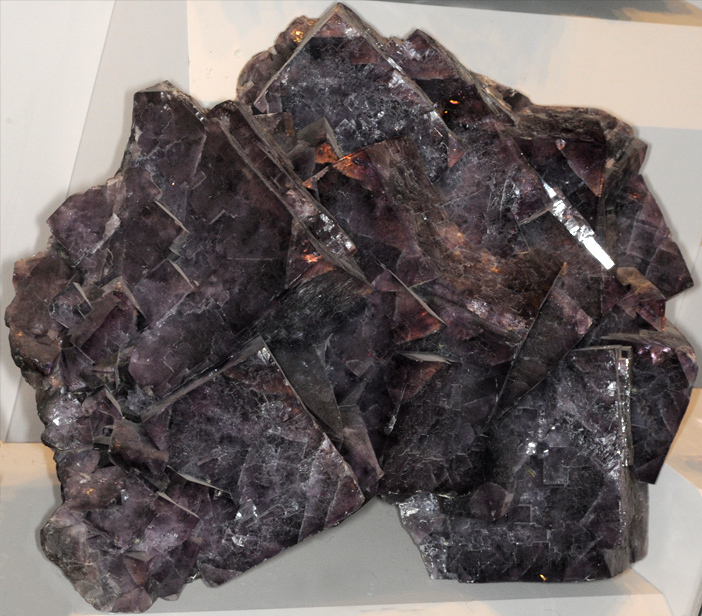 This fluorite sample is about 25 cm wide and is from Wolsendorf, Bayern, Germany. 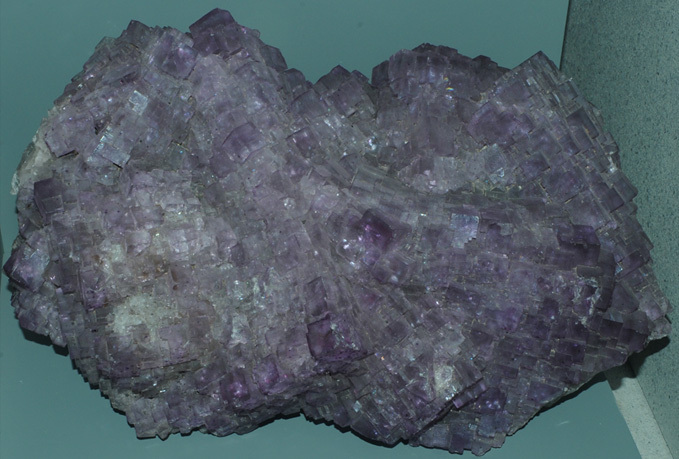 This fluorite sample is about 10x15 cm and is from Asturias, Spain. 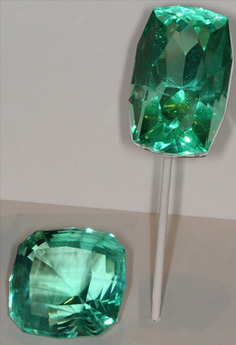 The 105.4 carat gem is from the same location, but has a very different color. 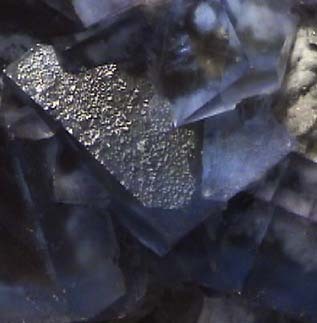 This sample is described as fluorite with quartz. It is about 24x40 and is from Leiyang, Hunan, China. 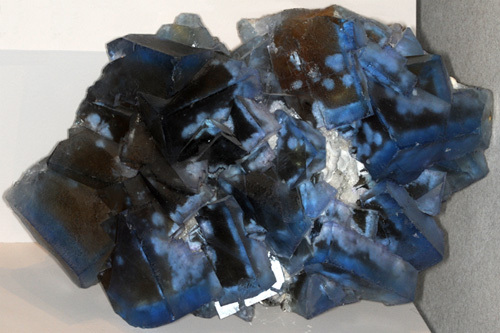 This sample of fluorite is about 4x7 cm and is from Crystal mine, Hardin County, Illinois.